That is, they move orthogonally like the rook, but only one step at a time like the king. How many such wazirs can be placed on an N×N chessboard so that no two wazirs can attack each other? On a 1×1 board, there can be only 1 such piece. On a 2×2 board, there can be 2 such pieces. On a 3×3 board, there can be 5 such pieces. 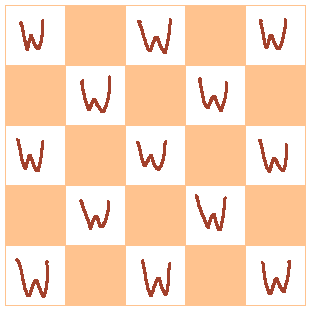 Given N, return the number of wazirs that can be placed on an N×N chessboard. This is OEIS sequence A000982. By the way, here is a proof that the ⌈n²/2⌉ formula is correct. 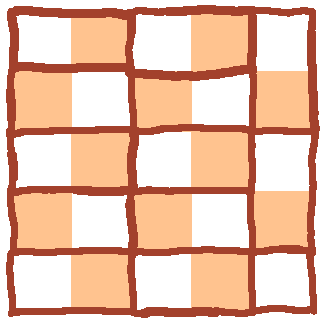 We can always place at least ⌈n²/2⌉ wazirs: just lay them out in a checkerboard pattern! Assuming the top-left tile is white, there are ⌈n²/2⌉ white tiles and ⌊n²/2⌋ black tiles on the n × n board. And if we place wazirs on the white tiles, no two of them are attacking each other, as every wazir only “sees” black tiles. Here’s how we place 13 wazirs on a 5 × 5 board (each W is a wazir). We need ⌈n²/2⌉ dominoes to cover the chessboard. Clearly, putting two wazirs on one domino makes it so that they can attack one another! So each domino can only contain at most one wazir, meaning we can’t possibly place more than ⌈n²/2⌉ wazirs on the board. Now uses Mr. Xcoder's formula. This is an anonymous prefix tacit function which takes N as argument. 2^: square; 2~: divide by 2, pushing the quotient then the remainder; +p: add the remainder to the quotient & print. 1 byte thanks to @ovs. Saved a byte thanks to Tahg; golfing n/2+n%2 to n+1>>1. Some people really do not like exploiting a certain compiler's undefined bahavior when using specific compiler flags. Doing so does save bytes, though. To Try it online!, compile and run the following C program. Square, increment, integer divide. Easy peasy. Input from stdin; it can take space or newline separated input and it will compute the max wazirs for each input boardsize. Output to stdout. ^ \ ) 2 , O @ . Which is the same algorithm that many use. O@ : print output as int, end program. ² squares, ½ halves, ı ceils. -1 thanks to Mr. Xcoder. Based on my APL solution. Been sitting on these since the challenge was closed. Explanation: Square, add 1, bit-shift right by 1.
Who needs golfing languages? I've got confusing languages! I'm a bit bummed the name got changed from "camels" to "wazirs" before I managed to write this, but I figured I'd post it anyway. /I/****/                                   Replace all `I` in the program by the input. /,*/+,//+/****//**,/,A//*/A//,//,****      Remaining part of the program. /,*/+,/                                    Use the `,` as a scanner, scan through `*` after it and convert to `+`. /+/****//**,/,A//*/A//,//++++,      Note that only `*` in the second group is affected. /**,/,A//*/A//,//****************,         Now at the last of the program before the `,` there are `n²` asterisks. replace each `**` by a `A` as the scanner `,` pass through. /*/A/                                      If there is any `*` remaining (if `n²` is odd), replace it with `A`. /,//                                  Remove the scanner `,`. Not the answer you're looking for? 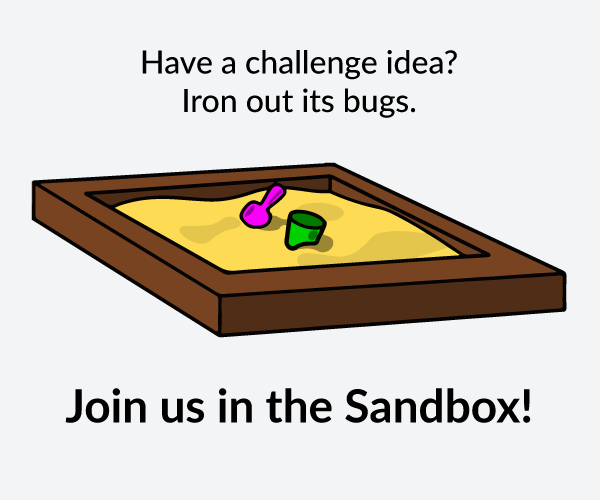 Browse other questions tagged code-golf number chess or ask your own question.